This paper categorizes Muslim beliefs and practices in postcolonial Indonesia—santri-abangan-priyayi, traditionalist-modernist, political-cultural, fundamentalist-liberal, great-little tradition, and global-local—and argues that, far from being fixed, they must be situated in context. Such a typology must consider contingency, diversity, and complexity, shaped by various factors. The terms santri and abangan are useful to identify fractions of the Muslim population in Java, but are not relevant in other islands. Santri, originally the students in religious schools (pesantren), now encompasses the wider category of the pious Muslims, whereas abangan refers to nominal Muslims. The two groups have a dynamic relationship, including its politicization in contemporary Indonesia. The traditionalist vs. modernist contrast, influenced by colonialism and the modernization theory, has prevailed, but Muslim groups often perceive their difference in non-fundamental religious matters, rather than in terms of tradition vs. modernity. The political vs. cultural Muslim contrast is between groups that stress politics and groups that do not, but many political Muslims are involved in cultural activities, as many may shift from political to cultural activism. The fundamentalist vs. liberal contrast, referring to the stricter vs. freer interpretation of Islam, emerged from Western and global circumstances, but such fundamentalism and liberalism have various meanings, including political. The contrast of the great vs. little tradition is also problematic if static situations, either “backward” or “civilized,” are implied. Finally, the contrast of local vs. global Islam reflects the impact of processes of globalization and localization, although it is also contingent. Cet article considère les diverses catégories utilisées pour différencier les croyances et pratiques musulmanes dans l’Indonésie post-coloniale – et propose que, loin d’être figées, elles sont à replacer en contexte, prenant en compte leurs circonstances, leur diversité et leur complexité, qui dépendent elles-mêmes de divers facteurs. Les termes santri et abangan, utiles pour distinguer des groupes de la population musulmane de Java, ne sont pas pertinents pour les autres îles. Santri, désignant à l’origine les élèves des écoles religieuses (pesantren), comprend désormais une plus large population de musulmans pieux, tandis que abangan désigne les musulmans nominaux. Les deux groupes ont une relation dynamique, qui est politisée dans l’Indonésie contemporaine. La distinction entre traditionalistes et modernistes, influencée par le colonialisme et la théorie de la modernisation, a prévalu, mais les groupes musulmans perçoivent leur différence sur des points religieux mineurs, plutôt qu’en termes de tradition et de modernité. La distinction entre islam politique et islam culturel se pose entre les groupes qui mettent l’accent sur la politique et les autres, mais de nombreux musulmans politiques s’impliquent dans des activités culturelles, et beaucoup dérivent de l’activisme politique à l’activisme culturel. La distinction entre fondamentalistes et libéraux, issue de circonstances occidentales et globales, renvoie à une plus ou moins stricte interprétation de l’islam, mais ces termes recouvrent plusieurs sens, y compris un sens politique. La distinction entre petite et grande tradition est aussi problématique lorsqu’elle suppose des situations statiques, « arriérée » ou « civilisée ». Enfin, la distinction entre islam local et global, reflétant l’effet des processus de globalisation et de localisation, est elle aussi contingente. 1Over the last fifty years, Islam in Southeast Asia, particularly Indonesia, has received greater scholarly attention from political scientists, historians, and anthropologists.1 In continuing efforts to understand Muslim beliefs and practices in Java in particular and the archipelago in general, the number of studies on Islam has increased signif-icantly. In these works, however, there is still a tendency to categorize Muslim beliefs and practices using terminologies that might not be used by Muslims themselves, or that have been used universally rather than contingently. I argue that, while these categories and terminologies have been accepted and incorporated by some Muslim scholars and some segments of the ordinary people into their academic and conversational language in postcolonial Indonesia, they need to be understood as dynamic and contingent. 2In this paper, I analyze the different ways in which some Western and Indonesian scholars have categorized Islam and Muslims, and I assess the value of their categorizations in understanding the complexity and change of Muslim beliefs and practices in postcolonial Indonesia (1945 to date). The categories that I discuss are santri-abangan-priyayi, traditionalist vs. modernist, political vs. cultural, fundamen-talist vs. liberal, great vs. little tradition, and global vs. local. 3In the systematic categorization of Javanese Muslim beliefs, the most important and influential scholar is undoubtedly the anthropologist, Clifford Geertz, who carried out ethnographic fieldwork in the village of Modjokuto in eastern Central Java between 1952 and 1954. Geertz intended to demonstrate the complexity, depth, and richness of Javanese spiritual life, although his categorization was in several ways problematic (Geertz 1960: 7). He developed three sub-variants, or sub-traditions, within the general Javanese religious system: abangan, santri, and priyayi. Abangan was more closely associated with the Javanese village and santri with the commercial world, although there are some santri elements in the village; priyayi was linked to the court or bureaucracy. Religiously, abangan were more animistic and santri more Islamic, whereas priyayi were more Hinduistic. Geertz claimed that these categories were not constructed types, but terms and divisions that the Javanese themselves applied (ibid. : 5-6). 4Let us consider the first category, the abangan. According to Geertz, the core practice of abangan is the slametan, the communal feast, which symbolizes the social unity of the participants. The feast is held in various occasions, such as birth, circumcision, marriage, and death (ibid. : 38-76). The Javanese people celebrate Islamic holy days, but there are additional calendrical, village-level, and intermittent slametan (ibid. : 77). Slametan is also held to protect the participants against the spirits (ibid. : 13-14). Belief in spirits provides them with a set of ready-made answers to the questions raised by unanswerable experiences. The abangan may also be involved in curing, sorcery, and magic (ibid. : 86-111). Geertz’s view that slametan is originally Javanese is not well founded. “Slametan” is derived from the Arabic word salama (سلم), which means “to live securely and peacefully.” Slametan is a communal space for the local Javanese, either the abangan or the santri, to greet and pray for peace and happiness among themselves. The difference is that abangan has slametan by combining different cultural elements, whereas santri does it in simpler and more substantive ways. But even this difference is fluid and changing because some santri sometimes join in slametan held by abangan. 5Geertz’s second category is santri, which originally meant “student,” of a pesantren (Muslim boarding school). It was used by Geertz to refer to those “true” Muslims, as they call themselves, or “Javanese Arabs,” as their opponents call them2 because the santri act more like the Arabs than the indigenous Javanese. Geertz observed that, toward the middle of the nineteenth century, the isolation of Indonesian Muslims from Islamic centers in the Middle East began to recede. Arab traders came in increasing numbers to settle in Indonesia and transmitted their “orthodoxy” to the local merchants.3 Indonesians also began to go on the pilgrimage to Mecca in increasing numbers. This new interaction with the center of Islam contributed to the development of local orthodox learning. As a result, rural Islamic schools and mosques became centers of orthodox learning, and those who lived in this orthodox environment were called santri. Geertz observed that santri began to see themselves as “minority representatives of the true faith in the great forest of ignorance and superstition, protectors of the Divine Law against the pagan crudities of traditional customs” (ibid. : 125). This orthodoxy of the village is of the old santri (santri kolot). But the drift toward “orthodoxy” (lit., “proper belief”) in rural areas was slow, Geertz observed. It was in towns that merchant ethics, nationalism, and Islamic modernism combined to produce a greater militancy. With the founding of the Muhammadiyah by a returned pilgrim in 1912 and the birth of its political counterpart, Sarekat Islam (The Islamic Union), in the same year, the sense of “modern orthodoxy” (thus, santri moderen) predominated in the towns and spread to the villages (ibid. : 126). 6Thus, Geertz outlined general differences between santri and abangan. The santri, he wrote, are more concerned about Islamic doctrine, especially its moral and social interpretation. Urban santri are different from rural santri. According to Geertz, town santri are more “apologetic,” that is to say, they are committed to the defense of Islam as a superior ethical code and a social doctrine for modern society. In the countryside, the doctrinal aspect is less marked: there the santri ethics remain closer to the abangan. But rural santri, said Geertz, are different from the abangan in their self-declared religious superiority and their insistence that Islam is doctrinal. The abangan are fairly indifferent to doctrine, but are concerned about ritual details, while remaining tolerant toward different religious beliefs. Geertz observed, the abangan would say, “many are the ways,” whereas the santri regard abangan rituals as heterodox. Another difference, said Geertz, lies in social organization. For the santri, religious organizations are important, as they view the sense of community (ummat) as primary, while the abangan are more focused on the household, the family. Santri seek to apply Islamic law through organizations, primarily four types of social institutions: political parties, religious schools, the Ministry of Religion, and more informal congregational organizations (ibid. : 127-130). 7As discussed above, within the santri variant, Geertz distinguished the conservative (kolot) from the modern (moderen). The conservative, he said, tends to emphasize a relationship with God in which one’s life is fated by God’s will, whereas the modern tends to stress a relationship with God in which hard work and self-determination are important. The conservative tends to hold to a “totalistic” concept of the role of religion in life, in which the religious and the secular tend to be blurred, whereas the modern holds a more narrow notion of religion in which the secular and the sacred tend to be distinct. The conservative tends to be less concerned with the purity of his Islam and more willing to grant non-Islamic rites at least a minor place within the religious sphere, whereas the modern tends to be concerned with a purity of Islam. The conservative tends to rely on the detailed scholastic learning in traditional religious commentaries, whereas the modern tends to be pragmatic and rely on the general reference to the Koran and the Prophetic tradition (Hadith) (ibid. : 149-150). Geertz summarizes this kolot-moderen distinction as follows: A “fated” life vs. a “self determined” one; a “totalistic” view of religion vs. a “narrowed” one; a more “syncretic” Islam vs. a “pure” one; an interest in “religious experience” vs. an emphasis on “the instrumental aspect of religion;” the justification of practice by “custom” and “scholastic learning” vs. the justification by the “spirit of the Koran and the Hadith” (ibid. : 159-160). 9Geertz’s third category is priyayi, a term applied to the Javanese nobility. Geertz viewed the priyayi as closer to the abangan because both are “not-purely-Islamic” groups. Nonetheless, the abangan tradition serves to define the basic social interrelationships of the land-bound peasantry, whereas the priyayi live in the towns. As aristocrats, they see themselves as superior to the non-priyayi because of wealth, lifestyle or, most importantly, descent. They conceive of life in terms of hierarchy, power, and privilege. The priyayi have three major foci of religious life: etiquette, art, and mystical practice. In terms of etiquette, the priyayi use the refined (alus) Javanese language, and tend to be indirect and avoid conflict. In terms of arts, they have the shadow puppet theater (wayang), percussion orchestra (gamelan), court dances (joget), and textile decoration (batik). Although wayang and the gamelan music are also performed in the abangan and even santri contexts, it is largely the priyayi who regard wayang as an expression of their values (ibid. : 277-288). Religiously, the priyayi endorse mysticism (kebatinan, inner-selfness), that is, an applied metaphysics, or a set of practical rules for the enrichment of man’s spiritual life (ibid. : 310). Priyayi mysticism holds to religious relativism that all religions are the same. The priyayi call the santri fanatics, as opposed to themselves, who are “tolerant” (ibid. : 336). The problem with the priyayi category is that it is not a religious one, but a socio-economic one. Java actually had santri coming from the priyayi socio-economic group. 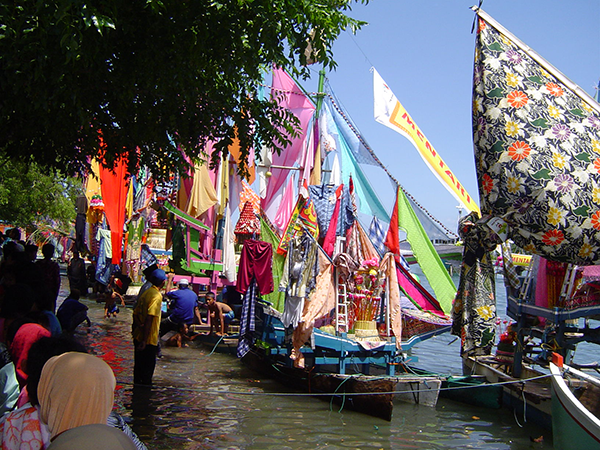 Many santri wore batik and enjoyed wayang and many abangan did not like wayang or gamelan. Thus, my point is that, although the characteristics may be applied, these should not be essentialized as static and unchanging. 10Furthermore, Geertz argued that there are common values and some interrelationships among these three variants. First, he wrote, there is considerable antagonism between the adherents of these groups, which is increasing; second, despite these differences, the Javanese do share many common values; third, several factors tend to exacerbate the conflict among the three groups, while several others tend to moderate it. The former are intrinsic ideological differences, the changing system of social stratification and increased status mobility, the struggle for political power, and the need for scapegoats; the latter are the sense of a common culture, the fact that religious patterns do not become embodied in social forms, a general tolerance based on a “contextual relativism,” and the steady growth of social mechanisms for a pluralistic form of social integration (ibid. : 355-356). Although Geertz acknowledged commonalities and integration, he remained trapped in his distinct and separate categories. What concerned him was what caused the groups to be in conflict or at peace, rather than what actually happened to them in terms of overlapping cultural traits. 11Geertz’s analysis stimulated refining and critical analyses.5 Following him, anthropologist James Peacock agreed with the three variants, but developed the santri category further. Geertz had divided the santri into the reformists (santri moderen) and traditionalists (santri kolot). To reinforce the distinct characteristics of the reformist santri, Peacock combined Geertz’s cultural analysis with psychological analysis and statistics (Peacock 1978: 26-27). According to him, the reformists displayed several particular characteristics: Theologically, they believed in ijtihad (rational personal interpretation of Islam) and the purification of tradition. Organizationally, they were members of the Muhammadiyah (founded in 1912 in Jogjakarta) or other reformist organizations. Educationally, they were students of Muhammadiyah, either of the government or of the madrasah (non-governmental Islamic schools). In contrast with the syncretists, the reformists had less belief in sacred relics, in messianic princes, in spirits, were less likely to participate in slametan (communal feasts), and placed a higher priority on observance of the five daily prayers than on meditative communion with God (ibid. : 50). Thus, Peacock simply reinforced the categorization that Geertz had proposed. Unlike Geertz, who relied on qualitative sources, Peacock provided more quantitative material by drawing on psychological and statistical accounts of the modern santri variant. 12The mass politicide of the 1965-66 changed the previously prevalent polarization and provided the political context for the Islamization of the nominal Muslims (abangan and priyayi), a process sometimes called santrinisation. As Martin van Bruinessen has pointed out, the fear of being accused of atheism and, therefore, of communism made many abangan turn to Christianity, Hinduism, or Islam (Van Bruinessen 1999: 46-63). 13Historian Merle Ricklefs finds it useful to explain the conflict between the Muslims and the Indonesian Communist Party (PKI) up to the 1965 coup d’état. The political context shaped changes in categories of Islam. He wrote: “Since most PKI supporters in Java were from the abangan community, these slaughters only exacerbated santri-abangan hostility at village level” (Ricklefs 1981: 274). However, he later refined Geertz’s theory of categorization, arguing that the reality seemed more complex than his predecessor had suggested, and that an accurate depiction of Javanese society requires a three-dimensional model with vertical, horizontal, and lateral axes. The vertical axis defines social class, with several major classifications and infinite minor gradations. At the top is the elite, priyayi. At the bottom is the peasant, called wong cilik, “little man.” On an horizontal axis, the religious distinction ranges from the nominally Muslim abangan, with a commitment to Javanese culture and little knowledge or concern about Islam, to the santri, who takes Islam as the principal regulating factor in daily life. The third axis is within the ranks of the santri: the old-fashioned (kolot) and the modernist (moderen). Thus, according to Ricklefs, there are a number of combinations of categories: priyayi-santri, wong cilik-abangan-kolot, priyayi-abangan-kolot, priyayi-abangan-modern, wong cilik-santri-kolot, wong-cilik-abangan, and so forth (Ricklefs 1979: 118-120). Theses categories show how religious identity can be mixed with social class and the tradition-vs.-modernity spectrum. In other words, Ricklefs argued against a tendency towards a simple universalization of the binary categorization. 14More recently, Ricklefs argued that the categorization of abangan that Geertz used “was not wrong but it was historically contingent” (Ricklefs 2006b: 35). He agreed with Geertz in defining the abangan as nominal or non-practicing Muslims, but he suggested that the term did not emerge before the mid-nineteenth century. The abangan was originally a term of derision used by the pious putihan, the “white ones,” as the santri called themselves. The anthropological study by Geertz seemed to ignore the historical, contingent dimension of any social category. As Ricklefs put it, “a fluid, contingent social reality was perceived as fixed because no one had yet done the historical research to show that it was not so. The anthropological interest in social structures and relationships gave insufficient attention to historical contingencies, and a view of Javanese society was born that implied that there were little changes” (ibid. : 38). Ricklefs coined the term “mystic synthesis” for nineteenth-century Java to refer to a segment of Javanese society, who were both Javanese and Muslim, who learnt Arabic and the fundamentals of Islam, and learnt the old belief, Hinduism and Buddhism, from the wayang, from a teacher (guru), and from reading indigenous Javanese works (ibid. : 41). From around the 1850s, Javanese society began to divide into the majority abangan (nominal Muslim) and the minority putihan (pious Muslims). This polarization became politicized during the anti-colonial movements of the first half of the twentieth century (Ricklefs 2006a: 7-8). 15Another anthropologist, Andrew Beatty, implicitly accepted the categories of santri and abangan, but made some qualifications to these. According to him, Geertz’s three religious variants seem to inhabit separate worlds, with each group being consistent with its separate identity. In the 1990s Beatty observed that much of rural Java was populated by heterogeneous communities, in which many individuals were neither clearly santri nor abangan; many were located in-between. Santri, for example, intermingled with abangan. According to Beatty, this zone is that of compromise, inconsistency, and ambivalence, which cannot be captured by a categorical opposition of santri vs. abangan. He argued that the complexity of Javanese civilization resides not just in plurality but in interrelation, in the dynamics of religious adaptation and change (Beatty 1999: 115-116). 16Having briefly reviewed Geertz’s categories of Javanese religion and their development, we can now assess their value in understanding contemporary Islam in different areas of Indonesia. The three variants (santri-abangan-priyayi) have some applicability in the Javanese case. Although Geertz did not “discover” these terms, he made the first and the most systematized and detailed categorization of their usage. These categories are most widely cited in scholarly studies, not only of Javanese religion, but also, unfortunately, of Indonesia in general. The basic distinction between santri and abangan continues to be one of the most widely invoked categories for analyzing Javanese society, politics, and religion, as well as Indonesian religion and politics. Introductions to Indonesian Islam have employed the santri-abangan categories as indigenous terms to refer to the internal diversity of “Indonesian” religion (see, e.g., McAmis 2002). Thus, for example, the distinction between santri and abangan has been used to explain patterns of elite competition in the pre-War, Japanese, and early Independence periods (Benda 1958a), party mobilization and voting patterns in the 1950s (Feith 1957, Mortimer 1982, Jay 1963, Lyon 1970), the failure of the Indonesian Communist Party (PKI) to build an effective class alliance of the rural poor (Mortimer 1982, Wertheim 1969), and the intensity of violence that accompanied the destruction of the PKI in 1965-67 (Jay 1971). Developments under the New Order government (1966-98) have been explained with similar reference to this primordial socio-religious distinction between santri and abangan. Likewise, a journalist, Adam Schwarz, attempted to explain Indonesian politics throughout the twentieth century in terms of santri-abangan differences. Schwarz suggests that Muslim religious movements and political parties reflect the intra-santri debate and the santri-abangan differences (Schwarz 1994: 162-193). In the absence of any better way of describing Muslim society in Indonesia, Greg Barton also recognized that the terms had become an established usage in Indonesian politics and society (Barton 2002: 388 n 1). These scholars saw interactions between santri and abangan as the main feature in the development of not only the Javanese community but also all Indonesians (Hefner 1987: 533-534). 17Problems have arisen when other researchers used santri and abangan as bounded, distinct, and unchanging classifications. As time passes, categories of santri and abangan may not have been used as they were in the 1960s, or the definitions and connotations have changed. For some recent scholars, santri and abangan seem to be static categories and closed worldviews in which neither a person nor a group can change and adapt to new circumstances. Geertz himself did not claim that his variants were static, but later scholars and public figures tend to see santri and abangan in a binary opposition. For example, the president of the Prosperous Justice Party (PKS), Hidayat Nur Wahid, regarded Susilo Bambang Yudoyono as abangan (see Republika 2004). Hasyim Muzadi, the leader of the Nahdlatul Ulama, was described as santri, whereas Megawati Soekarnopoetri was seen as abangan; it was also said in the news that santri and abangan would become partners in the national race for president and vice-president on July 5, 2004. 18At the popular level in Java today, only a few non-religious Muslims would choose to describe themselves as abangan. More Muslims would prefer to be considered “good Muslims,” although they do not necessarily want to be called santri. Members of the dakwah movement that flourishes on Indonesia’s campuses, for example, do not label themselves santri, although they claim to be “more” Islamic than other students. These groups preferred the term salafi (“follower of the authentic old”) or Muslim Kaffah (“Muslim who is complete”). The term santri is today used to narrowly carry the notion of student of a pesantren, rather than that of “pious or good Muslim” in general, as Geertz and others have suggested. 19Some researchers have been more forthright in their rejection of Geertz’s categories. The anthropologist, Eldar Braten, who carried out fieldwork in Java in the 1980s, claimed that the categories of santri-abangan-priyayi could not completely be used for the people whom he was dealing with some thirty years after Geertz’s studies. In some cases, people did not even know the terms; in others, the terms carried different meanings from those that Geertz had identified. Different historical realities produced different notions of what it implies to be a Muslim and, instead of finding clear-cut categories, Braten discovered a situation characterized by contradictions (Braten 1999: 150-172). 20Yet, while later scholars tended to see a polarization between the three variants, a careful reading of The Religion of Java shows that Geertz himself saw them as interrelated. He argued that the three groups shared many common values and “were not nearly so definable as social entities as a simple descriptive discussion of their religious practices would indicate” (Geertz 1960: 355). Although he believed that a shared core of common values tended to counteract the divisive effects of variant interpretations of these values, he also felt that ideological, class, political, and psychological factors contributed to conflicts among the three groups (ibid. : 356). Furthermore, although he noted that the categories were not static, the tenor of his research implied that a person labeled santri at one time would not likely be labeled abangan at other times, and that a group could not be abangan in this place but santri in another. 21The most problematic of Geertz’s categories was undoubtedly that of priyayi. Western scholars, such as G.W.J. Drewes (1968, 1978) and Donald Emmerson (1976), and Indonesian scholars, such as Harsja Bachtiar (1973) and Parsudi Suparlan (1976), disagreed with some of the details of Geertz’s theory. Suparlan, for example, observed that priyayi denotes a social class—the nobility—rather than a sectarian religious group, and that many santri elements are found in priyayi culture. These early criticisms were reiterated in the late 1980s by Mark Woodward, who argued that the court at Jogjakarta was “more Islamic” than Geertz had suggested. Woodward contended that Islam, in its legalistic and mystical forms, is the predominant force in the religious beliefs and rites of central Javanese (Woodward 1989: 2-5).6 Furthermore, he wrote, instead of distinguishing between orthodox and syncretist Islam, one needs to distinguish legalistic from mystical Islam. Javanese Muslims are either normatively pious (shariah-minded) or mystical (Sufism/tasawwuf-minded). He suggested that it is the relationship between these two modes of religiosity that characterized Javanese Islam (ibid. : 6). 22Robert Hefner has criticized Geertz for what he believes is a marginalization of the role of Islam in Java. In his view, Geertz implied that abangan and priyayi are not largely Islamic, and that the Javanese were predominantly nominal or not “true” Muslims. For Hefner, Islam has not declined as a cultural force in Indonesia, and its role has long been predominant in Javanese culture and politics.7 Hefner wrote on Geertz: “Rather than talking of pluralism and subalterity within Islamic tradition, then, Geertz tended to see the Javanese Muslim community as split between those whom he effectively regarded as true Muslims, the so-called santri, and those whom he thought only nominally Islamized, the abangan.” He criticized Geertz in that the latter’s categorizations exaggerated Hindu-Buddhist influences in Java and oversimplified Islamic ones (Hefner & Horvatich 1997: 14-15). Following Koentjara-ningrat (1963), Kartodirdjo (1966), Ricklefs (1979), Dhofier (1982), and Boland (1982), Hefner argued that Geertz’s use of the term priyayi does not conform to Javanese usage, where the term refers to a distinction of social class (priyayi, or aristocrat, as opposed to wong cilik, or common people), not religious culture. In fact, some priyayi have been devout Muslims (Nakamura 1983). Because the distinction between abangan and orthodox Muslims tends to cut across classes, there are peasants and aristocrats who are santri, and others who are abangan. 23What seems to be missing in these criticisms is the location of Geertz’s own disciplinary and fieldwork context. Geertz wrote in the 1950s and 1960s of Modjokuto, a village in Java. His categories should not be generalized to all parts of Indonesia and at all times. He himself was influenced by previous scholars, including Robert Redfield, who worked on seventeenth- and eighteenth-century Western European society. Redfield (1955, 1956) proposed a distinction between gentry and peasantry, which Geertz found persuasive and then used in the context of Javanese society. The gentry represented Redfield’s “Great Tradition,” while peasants represented the “Little Tradition.” Thus, Geertz wrote: “The abangans are Java’s peasantry, and the prijajis its gentry. Abangan religion represents the peasant synthesis of urban imports and tribal inheritances…” (Geertz 1960: 227-228). In other words, his ideas were not set in a theoretical vacuum. 24Nor did Geertz ever claim that santri and abangan could be used for places outside Java. He was aware that these terms were not used in the outer islands, such as Sumatra, Sulawesi, Kalimantan, and Maluku, but other researchers have tended to use the santri vs. abangan distinction when speaking of Islam in other parts of Indonesia. This distinction has been wrongly assumed to be typical of Indonesian Islam, and has even been made to parallel the “orthodox” vs. “heterodox” contrast. For researchers who worked more recently and in other places, to be santri is to be orthodox and to be abangan is to be heterodox. Geertz’s ideas run dangerously close to being static because they have been applied by later researchers in different contexts. Critical scholars need to be aware of the fact that Geertz was an anthropologist working on a particular society at a particular time. His theories, influential though they have been, should not provide a basis for generalization on and simplification of Indonesian Islam. In short, his categorization should be understood as contextual and contingent. 25Another categorization related to the santri-abangan distinction is traditionalism vs. modernism, which is more related to the santri variant (modern and traditional santri), as mentioned above. No one knows for sure who first used the terms traditionalism and modernism in analyzing Indonesian Islam. In the early 1970s, an Indonesian political scientist, Deliar Noer, trained at Cornell University, wrote a book in which he explained Indonesian Muslim movements, especially during the period 1942-1945, by using the traditionalist vs. modernist categories. He did not reject Geertz’s ideas, but situated them in a more traditional-vs.-modern framework. He argued that the modernists or reformists drew inspiration from reformist ideas in Egypt, particularly those of Muhammad Abduh, whereas the traditionalists were more localized. The Muhammadiyah organization (founded in 1912) was representative of the modernists, whereas the Nahdlatul Ulama (founded in 1926) gathered the traditionalists. According to Noer, the traditionalists were mostly concerned with Islamic jurisprudence (fiqh), recognized the act of imitation in religious affairs (taqlid), and undermined the validity of individual efforts to rationalize religious matters (ijtihad). They were keen followers of the existing four schools of thought (mazhab): Shafi’i, Maliki, Hanafi, and Hanbali, the first being the predominant one. They participated in mystical practices that were, from a reformist point of view, close to polytheism, or associating God with beings and objects (shirk). They venerated shrines and graves of saints (keramat), gave offerings to spirits, held communal feasts (slamatan or kenduri), and used charms or amulets (azimat) to protect themselves from evil spirits or bad luck. They did not question whether these practices were compatible with Islam. For Noer, they simply followed the path of both religion and tradition without realizing their distinction. 26On the other hand, the modernists, Noer observed, were concerned with the spirit of Islam in general. To them, Islam was compatible with modern times and encodes understandings of progress, knowledge, and science. In their eyes, the traditionalists were guilty of introducing innovation in religious matters (bid’ah). The modernists recognized only the Koran and the Hadith (prophetic tradition) as the basic sources of their ideas and practices. They maintained that the gate of ijtihad (rational interpretation of Islam) was still open. The modernist teachers did not endorse the infallible position of the traditionalist teachers (kiyai). They readily adopted the organizational and educational methods and ideas of the West, including those of Christian missionaries, as long as these were not in violation of the principles of Islam (Noer 1973: 300-308). In general, both the traditionalists and modernists claimed that they merely differed from each other in details (furu’), but were in agreement as far as Islamic principles (usul) were concerned. The principles are the pillars of Islam (rukun Islam), comprising the belief in God and in the Prophet Muhammad, prayer, alms giving, fasting, and the pilgrimage to Mecca; and the pillars of belief (rukun Iman), comprising the belief in God, the Angels, the revealed scriptures, the prophets, the Day of Judgment, and the destiny of man for good or evil. The modernist-traditionalist distinction became widely used, and was then reinforced by other scholars of Indonesian Islam, partly because these categories seemed “present-oriented” and, therefore, appealed to contemporary specialists. 27What is lacking in Deliar Noer’s analysis is the wider context for the emergence of this distinction and the fact that it was not universal. Noer did not take seriously the political and educational contexts for the emergence of traditionalist and modernist Muslims, including the Dutch colonial education, the Muhammadiyah education (that adopted Dutch methodology of the classroom and curriculum), and the renaissance of the pondok-based religious teachers (kiyai). Many of the kiyai felt threatened and attempted to maintain their existing practices of education, such as sorogan (surrounded by seated students reading Arabic books, the teacher corrects them immediately), though they adopted some of the modernist methods of teaching. 28The role of Dutch and other, later Western scholars in introducing the terms traditionalist and modernist should also be recognized. Local people in Java often used the term Islam kolot (traditional Islam) and Islam moderen. Others used the phrases Islam taat (“pious Islam”) and Islam tidak taat (“non-pious Islam”). However, the definition and application of these phrases were not always used. Other, more Koranic terms were more popular, such as Muslim, Mu’min, Kafi, Munafik, Mushrik, Fasiq, to refer to different qualities. 29The traditionalist-modernist categorization treats Muslims as historically and sociologically similar to other religious communities in the modern world, which seems quite inevitable in the era of globalization when the use of English became taken for granted. The strength of these categories is that Muslims can be also “modernized,” challenging the assumption that Muslims were inherently “traditionalist” in their religious beliefs and practices. It was assumed that they could never become “Westernized” if modernity meant Westernization, because Islam and the West are inherently incompatible. Despite this comparability of Muslim and Western societies, there is the danger of making Western categories universal. 30There is little understanding among Muslim society in Indonesia that the concepts of tradition and modernity are originally Western constructs. Behind this distinction is the modernization theory, according to which history moves in a linear fashion from tradition to modernity. All other peoples, including Muslims, should follow this direction from tradition to modernity. It is a theory explaining the process by which historically evolved institutions are adapted to the rapidly changing functions that reflect an unprecedented increase in man’s knowledge, and permit his control over the environment (Black 1975: 7; Bentley 2003: 8-11). In this sense, making Muslims part of world history also means making them part of Euro-American history. Thus, if this theory is recognized by the user of the traditionalist-modernist distinction, its application causes no harm. 31There are other problematic issues related to the traditionalist-modernist division. While Muslim modernists are happy to claim themselves as modernists, the “traditionalists” would not classify themselves as such. Only few people would like to be called “traditionalists,” because the term connotes a lower level in the social hierarchy. Moreover, although he used the terms himself, the political commentator Greg Barton admitted that, in many respects, the terms of Islamic “modernism” and “traditionalism” are “confusing and unhelpful.” When Islamic modernism first came to Indonesia at the beginning of the twentieth century, it was a progressive and reformist movement, but half-way through the century there were signs that parts of the modernist movement were becoming conservative. In time, the modernist movement became focused on preserving the distinctiveness of its people and their practices against the influences of an increasingly secular world. By the end of the twentieth century, Barton argued, the modernists were divided into the moderate and the conservative. At the same time, although rural traditionalists continued to be culturally conservative, many of their children, having graduated from pesantren (Islamic boarding schools) and gone on to higher studies (such as the State Institute for Islamic Studies, IAIN), were at the forefront of progressive thought and religious reform. A number of scholars, such as Abdurrahman Wahid and the younger generation of the Nahdlatul Ulama, in particular, were in many respects modernists in their orientation, whereas many Muhammadiyah scholars were becoming conservative, because they grew up with limited knowledge of Arabic writings and were not able to participate in the re-examination of Islamic teachings (Barton 2002: 66-67). 32Barton suggested that, within the santri community, a distinction is made between modernists, most of whom belong to the Muhammadiyah, and traditionalists, the vast majority of whom belong to the Nahdlatul Ulama (Barton 2002: 62-79). On Java, the traditionalists outnumber the modernists, particularly outside the big cities, but on other islands the situation is very different. In most of Sumatra and in southern Sulawesi, the modernists easily outnumber the traditionalists. 33In other cases, the modernists were no longer simply modernist; they turned now to be post-modernists, as the traditionalists turned to neo-traditionalists (see, e.g., Pranowo 1990: 480-481). Thus, what used to be called “traditionalist” could be progressive and liberal in terms of seeking new ideas and incorporating them into their own intellectual vocabulary. The Nahdlatul Ulama, for example, has produced more “liberal” thinking and progressive associations than the so-called modernist Muhammadiyah in contemporary Indonesia (Feillard 1999). The liberal groups, however, often cross-cut the traditionalist-modernist boundaries, such as in the case of the Liberal Islam Network (Ali 2005). 34The traditionalist-modernist distinction is helpful in some respects, but its context should be understood. It cannot be inherently binary-oppositional and should be situated in context. The use of these convenient terms is common among Westerners and many Muslims alike, but one needs to be aware of the Western assumptions behind the distinction, and recognize that this distinction is not static. 35Now let us turn to the next categorization, more political in nature, which emerged as many Muslims became political ideologues and activists, whereas other Muslims remained a-political. Snouck Hurgronje, the adviser to the Office of Native Affairs (1899-1906) introduced the distinction between political Muslims and cultural or religious Muslims in his attempt at distinguishing the native groups that would from those that would not resist Dutch colonialism (Benda 1958b: 40-42). This distinction between political and non-political became more important in the early twentieth century, when the ulamas and activists established associations, such as the Sarekat Islam in 1912, the Muhammadiyah in 1912, the Nahdlatul Ulama in 1926, and others. Although they were not political parties, these new organizations were either involved in politics or not, in response to Dutch and, later, Japanese colonial situations. The distinction between “political” and “cultural” Islam resurfaced in the post-Independence period, when Muslims became more involved in Islamic political parties or Islamic movements. The ideological struggle in Indonesian politics after independence in 1945 has often set the nationalists aside from the religious (Islam); the former advocate a tolerant state philosophy of Pancasila (the five principles), whereas the latter stress Islamic concerns, such as the establishment of an Islamic state or the implementation of Islamic law (sharia). 37One of the advantages of the political-cultural distinction is that Muslims are seen according to their political orientation. Politics is one of the fields in which Muslims have historically been engaged and with which they continue to deal; the first problem after the death of the Prophet Muhammad in the seventh century was political leadership, which led to the internal schism between the Shiite and the Sunni. On the other hand, there have been Muslims who distanced themselves from politics and stuck to non-political activities. 38However, the political-cultural distinction, like other categorizations, raises certain problems. In the first place, different scholars use the term “political Islam” in different ways. For example, the political scientist Harold Crouch refers not merely to Muslims involved in politics, but to Muslim politicians whose political agenda is inspired by distinctively Islamic concerns. In other words, an Islamic political agenda is the main characteristic of political Islam. Crouch further suggests that political parties in Indonesia are distinguished between “inclusive” and “exclusive” parties. An inclusive party would be a party that includes both Muslims and non-Muslims. Thus, the Indonesian Democratic Party-Struggle (PDI-P), the Nationalist Awakening Party (PKB), the Party of Golkar, and the National Mandate Party (PAN) are inclusive, whereas the National Unity Party (PPP), the Crescent and Star Party (PBB), and the Prosperous Justice party (PKS) are exclusive (Crouch 2002: 1-6). According to Crouch’s definition, the last three cited are represent-atives of contemporary political Islam. Thus, there is no scholarly consensus on how to define the political and the non-political. 39Another problem in this distinction is the tendency to overlook the fact that one group can be simultaneously political and cultural. A group such as the Nahdlatul Ulama (NU) became a political party before 1984. In addition, one group can be “political” at one time and “cultural” at another. Moreover, political Islam is not a monolithic entity, since there are Muslims who are engaged in Islamic political parties, while others promote political ideas without being members of any political party. Amien Rais, for example, used to be the chief of the Muhammadiyah and then became a leader of the National Mandate Party. Abdurrahman Wahid and Hashim Muzadi, from the NU, became political leaders. 40Another issue is that one person or one group could switch from being political to being a-political, and the other way around. Abdurrahman Wahid, for example, was said to endorse cultural Islam, but he established a political party, Partai Kebangkitan Bangsa (the Nation’s Awakening Party), and engaged in political discourse and debates, became president, and then returned to non-governmental associations. He continued to stand against the creation of an Islamic state, but remained politically active in promoting democracy and pluralism through both political and cultural channels. 41Islam has been defined in various ways by various scholars, activists, and the people. The Pancasila has been also interpreted differently. Apart from the New Order’s efforts at monopolizing it for all Indonesians, the interpretation of the Pancasila remained open, unfinished, and flexible (Pranowo 1990: 494-496). Political Islam is not against the Pancasila per se. Its goals and agenda vary and change according to groups and circumstances. 42Still another problem is the recent movement to promote the application of Islamic law at the regional level without mentioning the Islamic state. The strategy of these pro-Islamic bylaws was political, but still within the Pancasila-state framework. The interpretation of the political has changed from simply invoking the idea of a formal Islamic state to the notion of the application of Islamic law at regional rather than national level. Thus, the political-cultural distinction is only helpful in some situations and should not be seen as a bounded typology resistant to change or reinterpretation. 43While the distinction between cultural and political Islam was based on political orientation, the next categorization is primarily based on doctrinal orientation—fundamentalist and liberalist Islam—and has been shaped by academic debates that include more Indonesian scholars. Indonesian scholars and socio-political commentators have tended to use “fundamentalism,” a term borrowed from American Christian groups in the early twentieth century who whished to orient their religious practice to the fundamentals (as they saw them) of particular Biblical Christian teachings.8 Because “fundamentalism” has been broadly used to refer to any movement with a strongly religious element, it has become an overarching category for any ideas or groups that encourage religious rigidity manifested in the social, political, and economic fields. Thus, strict adherents of Islam have been generally labeled as “fundamentalists,” as have Muslim women who wear headscarves, men who demonstrate on the streets against United States foreign policies in the Middle East, or Muslims who promote an Islamic state in their countries. 44Most “fundamentalists,” however, do not use the term “fundamentalism” in reference to themselves. In Indonesia, fundamentalist Islam, or other similar phrases such as “militant Islam,” “radical Islam,” and “revivalist Islam,” are only used by those outside the group. Although there are some exceptional cases in which fundamentalists do use the term,9 such labels are normally seen as pejorative. Another term, “Islamism,” is seen less negatively, and is now preferred to replace the phrase “Islamic fundamentalism.” Islamism is an idea or movement that struggles for an Islamic cause. “Islamism” and “Islamic fundamentalism” can be used to refer to the same ideas, although the former has more positive connotations. In a 2002 survey, “Islamism” was used in reference to a number of agenda indicators, such as the Islamic state, implementation of Islamic law, or Islamic parties (Mujani & Liddle 2004). 45In a survey carried out in 2001, some Indonesian scholars at the Center for the Study of Islam and Society, in the absence of a better term, used the terms “fundamentalism,” “radicalism,” and “Islamism” to refer to Islamic groups whose fanaticism and ideological basis are directed towards replacing the existing value system in society. If necessary, these groups are willing to employ physical force as a means to achieve their goals. In other words, the phrase “radical Islam” is used to describe a group of Muslims who promote the replacement of the established secular social and political order with a regime based on a particular interpretation of Islam. Some radical Muslims pursue this goal peacefully and in stages, through education, while others choose the route of open politics, contesting public offices in the executive and legislative branches. Some groups used the term jihad to refer to the struggle along the path of God. In contemporary Indonesia, these groups include Majelis Mujahidin Indonesia (MMI), led by Abu Bakar Ba’asyir, Front Pembela Islam (FPI), led by Habib Riziq Shihab, and Forum Komunikasi Ahlussunnah wal Jama’ah (FKAWJ), led by Jafar Umar Thalib. Other Islamic parties, such as the National Unity Party (PPP), the Crescent and Star Party (PBB), and the Prosperous Justice party (PKS), are also regarded as fundamentalist (Jamhari 2002: 183-189; Muzani & Liddle 2004). 46“Liberal Islam” is the most recently used phrase in Indonesian Islam. The first scholar to employ it was Leonard Binder, a political scientist at the University of Chicago in his book, Islamic Liberalism (1988), but the phrase became more developed in Charles Kurzman’s book, Liberal Islam: A Source Book (1998). The first organization to use it was the Liberal Islamic Network (Jaringan Islam Liberal, JIL), founded in 2001. The major characteristic of liberal Islam is a “rational” interpretation of Islam, and liberal Muslims claim to promote democracy, tolerance, pluralism, human rights, and gender equality. For them, there is no such thing as an Islamic State, and the implementation of Islamic law in Indonesia should be rejected. The Liberal Islam Network emerged as a response to Islamic fundamentalism in post-Soeharto Indonesia (since 1998), initiating a new categorization in Indonesian Islamic discourse: the fundamentalist vs. liberalist Muslim. 47It should be borne in mind that, although fundamentalism and liberalism are Western constructs, it is advantageous to use these terms in a comparative context. Certainly it is convenient to discuss Islam by using popular or widely-accepted terms such as fundamentalism and liberalism. Yet, from the outset, these terms require clarification because of the confusion and misunderstandings that can arise when they are applied to Muslims. Most Muslims can be regarded as fundamentalists because they believe that they have to obey the fundamentals (principles) of their religion, but “fundamentalism” is often used pejoratively to label others who carry out strict religious activities, which some consider should be condemned and suppressed. The other term, “liberalism,” is also problematic in understanding Muslim beliefs and behavior, if understood in a fixed manner. Liberalism in Western use has different meanings in different contexts. Liberalism in the United States is different from that in Europe. Economic liberalism is different from political liberalism, and religious liberalism is also different. There are also different interpretations of liberalism among Muslims who call themselves liberals. Muslim liberalism and fundamentalism have a wide range of possibilities. In other words, the fundamentalist vs. liberalist distinction, like any other, should be used in a spectrum and not in a static fashion. 48We now turn to another categorization based on culture: great and little, or high and low traditions in Islam. This distinction has its advantages as well as disadvantages in analyzing Muslim societies in Indonesia and elsewhere, and is still influential today.10 The concept of a “great tradition” and a “little tradition” were first proposed by R. Redfield in his two books, The Little Community (1955) and Peasant Society and Culture (1956). It was Ernest Gellner, however, who developed the distinction between high and low traditions in relation to Islamic societies. Although Gellner referred to Islamic communities in general and did not write specifically of Islam in Indonesia, he employed categories that were later used by other scholars to refer to the case of Indonesian Islam as well. Gellner argued that Islam survives as a serious faith pervading both a folk tradition and a great tradition. Influenced by the theory of modernization, he argued that the Islamic great tradition is “modernizable.” He observed that the operation of the Islamic great tradition emerged as the continuation and completion of an old dialogue within Islam between the orthodox center and deviant error, between knowledge and ignorance, political order and anarchy, civilization and barbarism, town and tribe, Holy Law and mere human custom, a unique deity and usurper middlemen of the sacred. According to him, these polarities are latent in Islam. The folk tradition, on the other hand, represented cultural backwardness, hierarchy, non-egalitarianism, hereditary position, tribalism, and religious impurity (Gellner 1981: 5). Through history the two traditions flowed into and influenced each other. They also erupted into conflict, when reformers revived the alleged pristine zeal of the high culture, and united tribesmen in the interests of purification and of their own enrichment and political advancement (Gellner 1981). Thus, for Gellner, the Islamic great tradition is characterized by “scripturalism” (the idea that religious scriptures are on the highest position), egalitarianism (human and gender equality), and modernism (science and progress), whereas the Islamic little tradition is marked by tribalism, localized customs, kinship, and saints. 49Critics of Gellner’s views would contend that it is difficult to find which tradition is “great,” and which is “little” in Muslim beliefs and practices. It is too simplistic and now increasingly pejorative to label a Muslim practice as low, uncivilized, backward, and so forth, whereas another practice is “great” (i.e., civilized). To claim that a practice is “high” or “great” is not only hierarchical, but also ethnocentric. In addition, the great vs. little distinction again implies a static, unchanging situation and a lack of internal diversity. 50Having reviewed the santri-abangan-priyayi, traditionalist-modernist, political-cultural, fundamentalist-liberal, and great-little categorizations, we now come to the global vs. local perspective. This is, in some respects, a critique of the previous categories, although, as we shall see, some problems need to be addressed. 52The most recent contribution to the study of Islam in terms of the global-local framework is a collection of articles entitled Muslim Diversity and edited by Leif Manger (1999). According to Manger, Gellner describes Islam as a distinct historical totality, portraying a correlation of social structure, religious belief, and political activity to an extent that makes Islam a blueprint of the social order (Gellner 1981). Like Geertz’s theory of core symbols (santri-abangan-priyayi), Gellner’s ideas attempt to reduce Islam and the lives of Muslims to idealized patterns. Manger and the contributors to his collection attempt to look at ways to deal with dynamism in order to accommodate descriptions of a wide variety of beliefs and actions labeled Islamic by the people themselves. Their starting point is the diversity of Islam (Manger 1999: 2-4). 53The scholars in Muslim Diversity consider the way Islam has developed in its many local forms. For them, the great and little traditions are static typologies of what is great and little, high and low, developed and underdeveloped, civilized and uncivilized. These concepts limit instead of enhance insights into the complexities of local life. Instead of looking at idealized forms, one should examine the many processes that become Islamic and the many discourses that people express. A scholar needs to observe how people are pursuing various concerns in their lives within contexts. At the same time, Islam is not only a product of local, regional, and national situations, but also has a global nature in that for believers it contains generalized truths. 54Katy Gardner’s essay, “Global Migrants and Local Shrines: The Shifting Geography of Islam in Sylhet, Bangladesh,” shows how difficult it is to assume a unified terminology within Islam. The migrants she describes may appear fundamentalists in the sense that they base their views on adab (religious ethics), but at the same time they are modernists in the local Sylhet context. However, theirs is not a modernism oriented towards secularism, but one informed by religious traditionalism. In this case, the notion of great and little traditions is thus highly problematic (Gardner 1999: 37-57). How may we understand the nature, impulse, and dynamic of Muslim social and political action? More specifically, what are the relationships, direct or dialectical, between the prescriptions and requirements of Islamic belief, socially reproduced (of ‘being Muslim’, in short), and the economic, political, and social circumstances of the lives of actual Muslims? How are the real or supposed imperatives of ‘being Muslim’ understood, and in what terms and by whom, and with what social implications, are they expressed, conveyed, urged, argued, and acted upon? ( Roff 1987: 1-2). 56In another study, Mark Woodward provides a brief history of Indonesian Studies and why the Islamic factor has been peripheral in area studies and colonial Orientalism. He proposed a new paradigm in Indonesian Studies, that is, to focus on “how Indonesian cultures are Islamic,” rather than on “whether or not Indonesians are Islamic.” For him, it is the localization of Islam that needs to be the focus of study. The term “local Islam” consists of two elements; it is mistaken, Woodward argues, to neglect the “local” as it is to ignore the (global) “Islam” (Woodward 1996: 38-39). 57In one of his articles, Martin van Bruinessen also tried to explain post-Independence Muslims in Indonesia in light of a local-global perspective. He pointed out that Muslim pilgrims (hajj) to Mecca and Arab traders from the Hadramaut (sayyid) had for centuries served as the main agents of “global Islam.” The global expressions of Islam then received local challenges, like the Javanese literary texts (Serat Dermagandul and Serat Gatoloco, among others). The strain of spiritualism (kebatinan) and the customary law (adat) also provided alternatives to “global” Islam (Van Bruinessen 1999: 46-63). More recently, the dakwah (Islamic mission) movement became another expression of “global Islam,” which was countered by the local Islam (Islam pribumi) movements, such as the Nahdlatul Ulama and the Muhammadiyah, and other non-governmental youth organizations. The friction between Islamization (in the sense of Arabization) and Indonesianization (domestication and localization) of Islam therefore emerged as a revived if not new phenomenon in the landscape of Muslim movements in contemporary Indonesia. 58Nonetheless, a number of issues still require attention from scholars using this global-local perspective. First, complexity needs terms and simplifications. If one simply argues that Muslims are complex and diverse, he or she does not contribute much towards understanding what is actually going on. One should make sense of the complexity in terms that can be understood by academia or the readers at large. 60Third, it is not easy for academics to find what is changing and what is unchanging in religious belief and practice. Religious change is one of the most elusive issues. In this regard, I should agree with Geertz when he argues that “religious change is not measurable as economic change.” In the religious sphere, old wine goes as easily into new bottles as old bottles contain new wine. It is not only very difficult to discover the ways in which the shapes of religious experiences are changing, or if they are changing at all; it is not even clear to decide what sorts of things one ought to look at in order to find out. For Geertz, the comparative study of religion has been always characterized by the elusiveness of its subject matter. It is a matter of discovering just what sorts of beliefs and practices support what sorts of faith under what sorts of conditions. Our problem, Geertz suggested, is not to define religion but to find it (Geertz 1968: 1). 61Fourth, it is also difficult to determine which practice is religious, and which is non-religious. The concept of “religion” is originally Western. Perhaps, in many cases, local people see everything religiously. They may believe that their economic activities are part of their religious duties. In other cases, local people may see no clear distinction between the religious and the non-religious, and in lived expe-riences the distinction that academics may create is quite blurred or non-existent. 62Finally, it is worth noting that movements of ideas and people are now becoming more influential than they were in the past. It is therefore important to untangle the new transnational and trans-local linkages between people without becoming trapped in a bipolar local-global perspective. Contemporary supra-local identities (diaspora, refugees, migrants, etc.) are not spatial and temporal extensions of a prior identity rooted in locality, nor do we have to see the global as a new artificially imposed or inauthentic type of identity. In sum, then, the global-local perspective is useful in some respects, but problematic in others. The “spatial identity” that the perspective entails is only one of the different ways in which Muslims make identity boundaries. 63Categorization has long been seen as a principal scholarly task, not only in the sciences, but also in the arts and humanities. It has also become the concern of the ordinary people. In fact, the categories discussed above have been used by Indonesian Muslims for different reasons, in different contexts, and with different meanings. Because the realities are complex and diverse, they are of necessity simplified by observers according to certain perceptions and assumptions. Scholars have also understood that they should try to come as close as possible to the “realities.” As this paper has shown, while many scholars in Indonesia have sought to understand Muslims in their own terms, the very terms that they use have been influenced by outsiders. Despite the origins of categories, I would agree with Claude Lévi-Strauss: “Words,” he wrote, “are instruments that people are free to adapt to any use, provided they make clear their intentions” (in Braudel 1993: 3). Categorization becomes useful and helpful if it clarifies what one is trying to say in order to facilitate communication and understanding. However, while clarity is important in academic enterprise, the content of any category can be questioned and debated based on new perspectives, new materials, or both. 64As we have seen, complexity and diversity are the main features of Muslim societies. Models such as the santri-abangan, the traditionalist-modernist, the fundamentalist-liberal, the political-cultural, the great-little tradition, and the global-local are useful and to varying and changing degrees applied in Indonesia, but these categories should not be seen as static and unchanging. The more one understands the complexity and the details of particular groups and individuals, the more one comes to realize that the “traditionalist” can also be “liberal”, and the “modernist” can become “conservative.”12 The global and the local at once are not impossible. And so forth. Categories of Muslims are therefore contingent. 65This fluidity in terminology needed to be understood in Islamic studies and the history of religions. In this regard, I agree with Mark Woodward that the purpose of the history of religions is not to construct a comprehensive catalogue of religious belief and modes of ritual action. Even if this were possible, and it is not, Woodward suggested, such a catalogue would only describe, rather than explain, religious and cultural variation. But the goals also should not be restricted to personal interpretation. Rather, they should be to characterize the range of variation, to isolate the assumptions upon which religious discourse is based, and to explore the ways in which variation and discourse are shaped by social, political, and economic variables, as well as by more purely religious concerns (Woodward 1989: 77-78). 66Future Islamic studies in Indonesia should be geared to the ongoing effort to develop a theory of religious beliefs and practices. Religion is not only a set of doctrines, norms, and legal precepts to be enacted by individuals or groups, but it includes the ways in which individuals or groups interact with these patterns and use them to interact with their God and their environment.13 Islam—or, more accurately, Muslims—has been always dealing with both text and context, the persistent and the changing, the divine and the profane. The context may be spatial, mental, or psychical, but the dynamic interplay between text and context, persistence and change, divinity and profanity should not be overlooked in any careful study of Islam, in Indonesia or in other parts of the world. Ali, Muhamad, 2005, “The Rise of the Liberal Islam Network in Contemporary Indonesia”, American Journal of Islamic Social Sciences, 22 (1): 1-26. Azra, Azyumardi, 1999, Renaisans Islam Asia Tenggara, Bandung: Remaja Rosdakarya. Bachtiar, Harsja W., 1973, “The Religion of Java: A Commentary”, Madjalah Ilmu-ilmu Sastra, 5 (1): 85-118. Barton, Greg, 2002, Gus Dur: The Authorized Biography of Abdurrahman Wahid, Jakarta & Singapore: Equinox. Beatty, Andrew, 1999, Varieties of Javanese Religion: An Anthropological Account, Cambridge: Cambridge University Press. Benda, Harry J., 1958a, The Crescent and the Rising Sun: Indonesian Islam under the Japanese Occupation 1942-1945, The Hague & Bandung: W. van Hoeve. Benda, Harry J., 1958b, “Christian Snouck Hurgronje and the Foundations of Dutch Islamic Policy in the Netherlands Indies”, Journal of Modern History, 30 (4): 338-342. Bentley, Jerry H., 2003, Shapes of World History in Twentieth Century Scholarship, Washington: American Historical Association. Binder, Leonard, 1988, Islamic Liberalism: A Critique of Development Ideologies, Chicago & London: University of Chicago Press. Black, C.E., 1975, The Dynamics of Modernization: A Study in Comparative History, New York: Harper & Row. Boland, B.J., 1982, The Struggle of Islam in Modern Indonesia, The Hague: Nijhoff. Braten, Eldar, 1999, “To Colour, Not Oppose: Spreading Islam in Rural Java”, in Muslim Diversity: Local Islam in Global Contexts, Leif Manger (ed. ), Richmond: Curzon Press, p.150-172. Braudel, Fernand, 1993, A History of Civilizations, trans. Richard Mayne, New York: Penguin Books. Bruinessen, Martin van, 1999, “Global and Local Islam in Indonesia”, Southeast Asian Studies, 37 (2): 46-63. Certeau, Michel de, 1984, The Practice of Everyday Life, trans. Steven Rendall, Berkeley, Los Angeles, & London: University of California Press. Crouch, Harold, 2002, “The Recent Resurgence of Political Islam in Indonesia”, in Islam in Southeast Asia: Analysing Recent Developments, Singapore: Institute of Southeast Asian Studies, p. 1-6. Dhofier, Zamakhsyari, 1982, Tradisi Pesantren: Studi tentang Pandangan Hidup Kyai, Jakarta: Lembaga Pendidikan dan Penerangan Ekonomi dan Sosial. Drewes, G.W.J., 1968, “New Light on the Coming of Islam to Indonesia?”, Bijdragen tot de Taal-, Land- en Volkenkunde, 124 (4): 433-459. Drewes, G.W.J., 1978, An Early Javanese Code of Muslim Ethics, The Hague: Martinus Nijhoff. Eickelman, Dale F., 1982, “Study of Islam in Local Contexts”, Contributions to Asian Studies, 17: 1-18. Emmerson, Donald, 1976, Indonesia’s Elite: Political Culture and Cultural Politics, Ithaca, NY: Cornell University Press. Fadjar Indonesia, 1931, Year 1, No. 4, 15 January 1931. Feillard, Andrée, 1999, NU vis-à-vis Negara: Pencarian Isi, Bentuk dan Makna, Yogyakarta: LKiS. Feith, Herbert, 1957, The Indonesian Elections of 1955, Ithaca, NY: Cornell University, Modern Indonesia Project. Gardner, Katy, 1999, “Global Migrants and Local Shrines: The Shifting Geography of Islam in Sylhet, Bangladesh”, in Muslim Diversity: Local Islam in Global Contexts, Leif Manger (ed. ), Richmond: Curzon Press, pp. 37-57. Geertz, Clifford, 1960, The Religion of Java, Glencoe, Ill.: The Free Press of Glencoe. Geertz, Clifford, 1968, Islam Observed: Religious Development in Morocco and Indonesia, New Haven & London: Yale University Press. Geertz, Clifford, 1973, “Ritual and Social Change: A Javanese Example”, in The Interpretation of Cultures: Selected Essays by Clifford Geertz, New York: Basic Books, p. 142-169. Geertz, Clifford, 1995, After the Fact: Two Countries, Four decades, one Anthropologist, Cambridge: Harvard University Press. Gellner, Ernest, 1981, Muslim Society, Cambridge: Cambridge University Press. Hefner, Robert W., 1987, “Islamizing Java? Religion and Politics in Rural East Java”, Journal of Asian Studies, 46 (3): 533-554. Hefner, Robert W., 1997, “Islam in an Era of Nation-states: Politics and Religious Renewal in Muslim Southeast Asia”, in Islam in an Era of Nation-states: Politics and Religious Renewal in Muslim Southeast Asia, R.W. Hefner & P. Horvatic (eds), Honolulu: University of Hawai’i Press, p. 14-22. Hefner, Robert W., 2000, Civil Islam: Muslims and Democratization in Indonesia, Princeton: Princeton University Press. Hefner, Robert W., & Patricia Horvatich (eds), 1997, Islam in An Era of Nation-States: Politics and Religious Renewal in Muslim Southeast Asia, Honolulu: University of Hawai’i Press. Jay, Robert T., 1963, Religion and Politics in Rural Central Java, New Haven: Yale University, Southeast Asian Studies. Jay, Robert T., 1971, “History and Personal Experience: Religious and Political Conflict in Java”, in Religion and Change in Contemporary Asia, Robert R. Spencer (ed. ), Minneapolis: University of Minnesota Press, p. 143-164. Kaltner, John, 2003, Islam: What non-Muslims Should Know, Minneapolis: Fortress Press. Kartodirdjo, Sartono, 1966, The Peasants’ Revolt of Banten in 1888: Its Conditions, Course, and Sequel, The Hague: Martinus Nijhoff. Koentjaraningrat, R.M., 1963, “Review of ‘The Religion of Java’”, Majalah Ilmu-ilmu Sastra Indonesia, 2: 188-191. Kurzman, Charles (ed. ), 1998, Liberal Islam: A Source Book, New York & Oxford: Oxford University Press. Loeffler, Reinhold, 1988, Islam in Practice: Religious Beliefs in a Persian Village, Albany, NY: State University of New York Press. Lyon, M.L., 1970, Bases of Conflict in Rural Java, Berkeley: University of California, Center for South and Southeast Asian Studies, Research Monograph No. 3. Manger, Leif (ed. ), 1999, Muslim Diversity: Local Islam in Global Contexts, Richmond: Curzon Press. McAmis, Robert Day, 2002, Malay Muslims: The History and Challenge of Resurgent Islam in Southeast Asia, Grand Rapids: Wm. B. Eerdmans Publ. Mortimer, Rex, 1982, “Class, Social Cleavage, and Indonesian Communism”, in Interpreting Indonesian Politics: Thirteen Contributions to the Debate, Benedict Anderson & Audrey Kahin (eds), Ithaca: Cornell University, p. 54-68. Mujani, Saiful, & R. William Liddle, 2004, “Islamism in Democratic Indonesia: Findings of a New Survey”, Journal of Democracy, 15 (1): 109-123. Nakamura, Mitsuo, 1983, The Crescent Arises over the Banyan Tree: A Study of Muhammadiyah Movement in a Central Javanese Town, Jogjakarta: Gadjah Mada University Press. Noer, Deliar, 1973, The Modernist Muslim Movement in Indonesia 1900-1942, London: Oxford University Press. Nye, Malory, 2003, Religion: the Basics, London: Routledge. Peacock, James L., 1978, Muslim Puritans: Reformist Psychology in Southeast Asian Islam, Berkeley, Los Angeles, & London: University of California Press. Porter, Donald J., 2000, “Citizen Participation through Mobilization and the Rise of Political Islam in Indonesia”, Pacific Review, 15 (2): 201-224. Porter, Donald J., 2002, Managing Politics and Islam in Indonesia, London & New York: RoutledgeCurzon. Pranowo, M. Bambang, 1990, “Which Islam and Which Pancasila? Islam and the State in Indonesia: A Comment”, in State and Civil Society in Indonesia, Arief Budiman (ed. ), Victoria: Monash University, Centre of Southeast Asian Studies, p. 479-500. Redfield, R., 1955, The Little Community, Chicago: University of Chicago Press. Redfield, R., 1956, Peasant Society and Culture, Chicago: University of Chicago Press. Republika, 2004, 28 March 2004. Ricklefs, Merle C., 1979, “Six Centuries of Islamization in Java”, in Conversion to Islam, Nehemia Levtzion (ed. ), London & New York: Holmes & Meier, p. 100-128. Ricklefs, Merle C., 1981, A History of Modern Indonesia c. 1300 to the Present, Bloomington: Indiana University Press. Ricklefs, Merle C., 1998, The Seen and Unseen Worlds in Java, 1726-1749: History, Literature, and Islam in the Court of Pakubuwana II, Honolulu: Allen & Unwin & University of Hawai’i Press. Ricklefs, Merle C., 2006a, Mystic Synthesis in Java: A History of Islamization from the Fourteenth to the Early Nineteenth Centuries, Norwalk: EastBridge. Ricklefs, Merle C., 2006b, “The Birth of the Abangan”, Bijdragen tot de Taal-, Land- en Volkenkunde, 162 (1): 35-55. Roff, William R. (ed. ), 1987, Islam and the Political Economy of Meaning, London: Croom Helm. Rossler, Martin, 1997, “Islamization and Reshaping of Identities in Rural South Sulawesi”, in Islam in An Era of Nation-States: Politics and Religious Renewal in Muslim Southeast Asia, R.W. Hefner & P. Horvatich (eds), Honolulu: University of Hawai’i Press, p. 275-308. SChwarz, Adam, 1994, Nation in Waiting: Indonesia in the 1990s, Boulder & San Francisco: Westview Press. Sumargono, Ahmad, 1999, Saya Seorang Fundamentalis: Refleksi Ideologis H. Ahmad Sumargono, Bogor: Global Cita Press. Suminto, Aqib, 1985, Politik Islam Hindia Belanda, Jakarta: LP3ES. Suparlan, Parsudi, 1976, The Javanese in Surinam: Ethnicity in an Ethnially Plural Society, un-published PhD dissertation, Urbana: University of Illinois. Wertheim, W.F., 1969, “From Aliran towards Class Struggle in the Countryside of Java”, Pacific Viewpoint, 10 (2): 1-17. Woodward, Mark R., 1989, Islam in Java: Normative Piety and Mysticism in the Sultanate of Yogyakarta, Tucson: University of Arizona Press. Woodward, Mark R., 1996, “Talking Across Paradigms: Indonesia, Islam, and Orientalism”, in Toward a New Paradigm: Recent Developments in Indonesian Islamic Thought, Mark R. Woodward (ed. ), Tempe: Arizona State University, p. 1-45. High school Muslim students were performing a traditionally Sundanese yet Islamic and modern cappella in a traditional Muslim wedding party in Sundanese Kuningan, West Java. One of the songs was played on a Boys II Men melody but with Islamic lyrics and themes. This illustrates how Sundanese youth could be Muslim, traditional, modern, local, and global, at the same time (photo: Muhamad Ali, 13 May 2006). 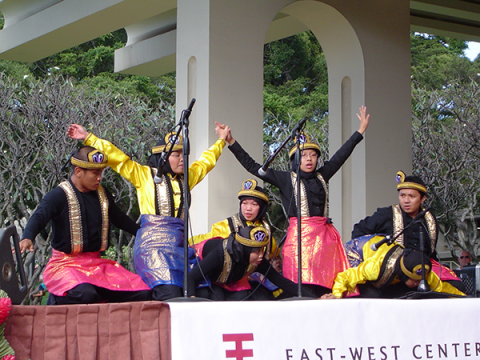 Acehnese dance performed by Indonesian students at the East-West Center, Tsunami Relief Fundraiser, Honolulu (photo: Muhamad Ali, 2 January 2005). Little tradition and great tradition mixed in Cikoang, Sulawesi; Muslims celebrating the Prophet’s birthday in luxury (photo: Muhamad Ali). Modern Quranic learning; children learning the Quran in a modern mosque in South Sulawesi (photo: Muhamad Ali, 22 June 2005). 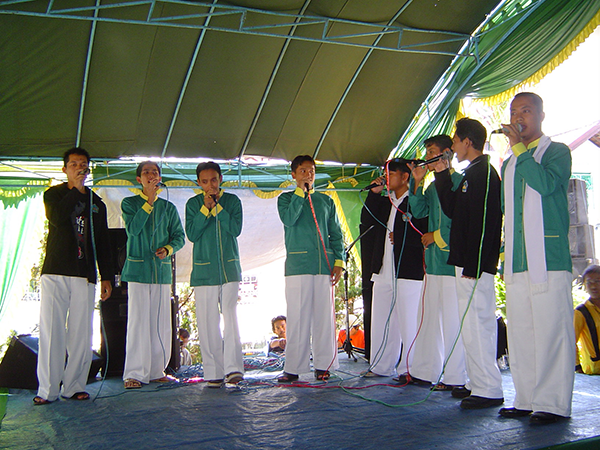 Muslim high-school santri singing songs in the pesantren in West Java (photo: Muhamad Ali, 11 February 2005). 1 I would like to thank Prof. Barbara W. Andaya of the University of Hawai’i at Manoa for her invaluable comments and advice on this article, and the participants in the Asian Studies at the Pacific Coast (ASPAC 2004) Conference held at the University of Oregon, Eugene, on June 18-19, 2004, for their comments and critics during the discussion, as well as the anonymous reviewers of this paper and the editors of Moussons. 2 Geertz wrote: “the kinds of santris vary from those whose difference from their abangan neighbors seems to lie entirely in their insistence that they are true Moslems, while their neighbors are not, to those whose commitment to Islam dominates almost all of their life.” Geertz also described santri as purer Muslims: “The purer Islam is the subtraction that I have called santri” (1960: 5, 127). 3 Orthodoxy is originally a Christian concept, but it can be applied to other religions as well. Orthodoxy literally means “proper belief,” but can be defined as a situation in which the content of a person’s faith is the critical component in determining whether or not a believer is a member of community. Having proper belief is what ultimately indicates the individual’s status in relationship to the group (see Kaltner 2003: 25-26). 4 A local newspaper editor argued that the distinction does more harm than good to the Muslim society (see Fadjar Indonesia 1931). 5 It is The Religion of Java that has attracted scholarly debates. His other books, including his lecture entitled Islam Observed, received less attention from other scholars. In 1967, Geertz gave a lecture at Yale University on Islam in Indonesia and Morocco, which later became a book, Islam Observed (1968). He argued that Morocco and Indonesia represented two different classical Islamic styles or orientations; Islam in the former was more activist, rigorous, and dogmatic, whereas in the latter it was syncretistic, reflective, and multifarious. He based this differentiation on a sixteenth-century figure, Javanese Sunan Kalijaga, in Indonesia and on a seventeenth-century figure, Sidi Lahsen Lyusi, in Morocco. However, even in the Modjokuto area in Indonesia, the contrast between the more self-conscious Muslim and the less self-conscious “nativist” grew steadily more acute, and until 1970 it formed the major cultural distinction. See Geertz 1968: 20, 29; 1973: 149. 6 Ricklefs (1998) supported the argument that by the eighteenth century, Islam had been dominant at the court. 7 Geertz actually later revised some of his arguments in The Religion of Java. By 1995, he wrote that the Javanese had been more Islamic than they used to be in the 1950s and 1960s (Geertz 1995). 8 The term fundamentalism has been extended to other religions. For example, many Sikhs in the 1980s were labeled as “fundamentalists” because of their campaign for Khalistan. In the 1990s, extremist Hindu nationalists were labeled as “Hindu fundamentalists.” There are also “Jewish fundamentalists,” those who see the eradication of the Palestinian presence in “Greater Israel” as a divine imperative, and “Buddhist fundamentalists,” who are engaged in a civil war in Sri Lanka with Tamil Hindus. See Nye 2003: 194. 9 For example, the activist Ahmad Sumargono, now one of the leaders of the Crescent and Star Party (PBB), wrote a book entitled I am a Fundamentalist (Sumargono 1999). 10 The Indonesian historian Azyumardi Azra, for example, still used the folk vs. great tradition distinction. He agreed with Gellner in that Sufism (mysticism) in many respects represented the folk, or low, or popular Islam, because it can accommodate local cultures. But he also argued that Sufism is not monolithic. There is, for example, a Neo-Sufism that emphasizes the life in this world. Muslim mystics such as Nur al-Din al-Raniri, Abd al-Rauf al-Sinkeli, and Nawawi al-Bantani viewed the world positively. They were also concerned with the Islamic law (sharia), although they did not fall into fiqh (legalistic products of jurisprudence). Thus, Azra argued, the great-little tradition distinction is helpful, but the Muslim reality is more diverse than this distinction suggests (Azra 1999: 23-24). 11 Martin Rossler, however, is still trapped in the bipolar great-little tradition distinction (Rossler 1997: 298). 12 See how the “traditionalist” Muslim turned to be liberal, as in the case of Abdurrahman Wahid, and the young generation of the Nahdlatul Ulama (see Feillard 1999). 13 Compare with Reinhold Loeffler (1988), who tends to study Muslims as individuals rather than as a collective group. For a theory of practice, see, e.g., Michel de Certeau 1984. Muhamad Ali, « Categorizing Muslims in Postcolonial Indonesia », Moussons, 11 | 2007, 33-62.